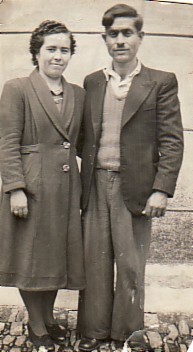 Above: With my husband, Giorgos. Above Right: In Athens, and it is the last night before migration. We are with family and friends. 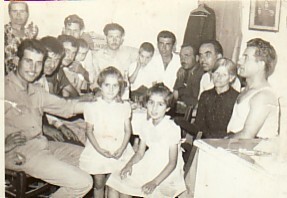 From left, we are: Myself (standing), Panagiotis Koutlis, Panagiotis Mavraganis (my father), Stratis Crisafis, Giorgos Tsimnadis (my husband)Panagiotis (my son), Lakis "Nikolaras", Christos (my son), "Bebi" Melandinos, unknown, Stathis Loupos, Permathia (Mavraganis (my mother), and Panagiotis Karambasis. In the front are my two daughters, Mersina and Persa. 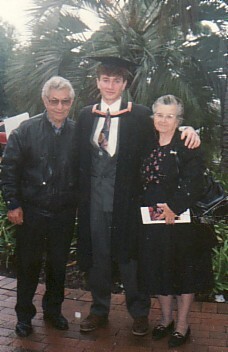 Above: With my husband, Giorgos, and our grandchild, Vasilios Koutlis, on his Graduation Day.